If you are in need of a filling to treat a cavity, you have several options to choose from as far as filling materials. There are pros and cons to each option, and your dentist can help you to choose the right one for you. However, understanding the pros and cons about some of the most popular can help you to make an informed decision about the right dental filling materials. However, there are some shortcomings to these fillings. The primary cause for concern is safety, as elemental mercury can make up as much as 54% of the material, and some people are concerned about possible toxicity. 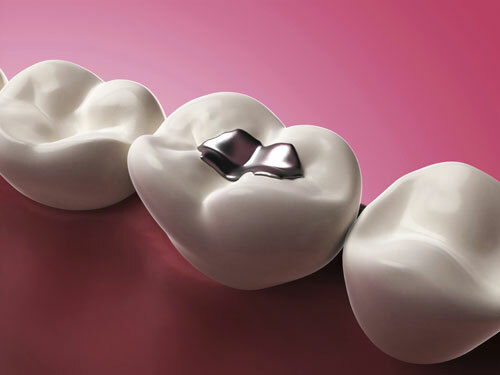 However, the FDA and CDC have investigated the safety of this material and have found that there is no proof to show that amalgam can harm patients, except in the cases of allergy, which is rare. Other negatives include the fact that the filling doesn't match the rest of the tooth and the fact that putting it into the tooth will require some healthy tooth removal. Composite resin fillings are made up of a mix of plastic resin and powdered glass in order to create a white or tooth-colored filling. This material is used for fillings as well as crowns, veneers, and inlays, and it can repair portions of broken teeth. The benefits of choosing a composite resin include the fact that these fillings are tooth-colored, they preserve the maximum amount of the natural tooth, and they are resistant to breakage. Porcelain is a material similar to glass that is formed into fillings using models of the teeth. This material is also used to create fixed bridges and crowns, and it is tooth-colored. Benefits include the fact that these fillings provide good resistance to additional decay as long as the restoration fits well, and porcelain is usually resistant to surface wear and leakage. However, this material can be brittle and might break under the biting forces, so it is not recommended for the molars. This material is a mix of resin polymer and glass along with an organic acid that will harden when exposed to a specialized light used in your dentist's office. It is tooth-colored and is more translucent than other options, but it is most commonly used to treat small fillings. Resin-isomer cement is a good option for fillings because it can provide a defense against decay by releasing fluoride, and a minimal amount of the tooth will need to be removed. It is great for non-biting surfaces, but its use can be limited because it isn't recommended to restore the biting surfaces of the teeth. Resin-isomer cement is also fairly expensive and might wear faster than amalgam or composite fillings. If you have additional questions about the types of dental filling materials available, contact our office for more information.